There is a real problem with trying to sell almost anything online – your website visitors cannot touch it, they cannot look around it, and they cannot smell it. Even when people buy books, they pick them up and get a “feel” for them. People love touching fabrics in clothes stores. And when buying technology people like to pick up the packaging and see the product from a variety of angles. All we get online is a two-dimensional picture that is flat and uninviting. Is it any wonder that around 90% of everything we buy is still purchased in real-world, bricks and mortar stores? For online businesses, selling more online depends on upon people getting a tangible feeling for what is on offer in the e-commerce shop. Amazon, for instance, cottoned-on to this need a few years ago when it introduced multiple images of each product so that the items could be seen from several angles. They also added videos enabling a 360-degree view of some things on sale. Most online shops, though, only provide a single, flat, two-dimensional image which prevents potential buyers from getting a real idea about the item on sale. New research into the concept of tangibility online has shown that when a shop makes attempts to give people a 3D view of items on sale, then there are higher levels of interest in such products. The study found that the most useful way of providing product tangibility was a “virtual mirror”. This is where you can use your webcam to see yourself with the item. This is employed by RayBan, for example, allowing you to see how a particular set of sunglasses looks on your own face. Many online spectacle stores use similar technology. The research found that the next best way of providing some degree of product tangibility was to have a 360-degree viewing system so that the web visitor could move around the image and focus on exactly what they wanted. This is better for the shopper as it lets them look at what they want, rather than a pre-set collection of individual images. Such technology is becoming increasingly popular in allowing people to look at hotel facilities, for instance. However, the bulk of what is for sale online is not tangible – even though the vast majority of items available for purchase are three-dimensional, physical products. If online stores want to increase their sales, they will do so by enabling shoppers to get a proper “feel” of what is being sold to them. 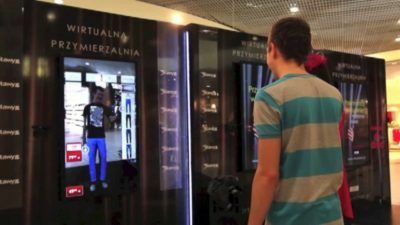 That means stores really need to consider 3D technology, 360-degree imagery and virtual mirrors.